Where we’ve come from…where we are now. You can help! To comprehend the struggle The Friends of Vintage Roses face working to save 3500 old rose varieties, we offer this aerial view of the garden, the pots and roses we must care for, and pass along to others who’ve volunteered to help us preserve. This image comes from 2 years ago, just prior to our work to remove blackberries from the garden and from swallowing 4000 roses in containers. Around the perimeter of the 3 acre site are rows and rows of roses in plastic pots. Your donations will aid us in weeding, repotting with fresh soil, feeding and mulching these roses. Many will be adopted by groups assisting the Friends. Others will bear new growth this summer that we will use to strike cuttings from, to share with others, and pass on in our yearly sale to supplement donations that keep us going. Step back to the 1990s for a glimpse of that beauty with me! 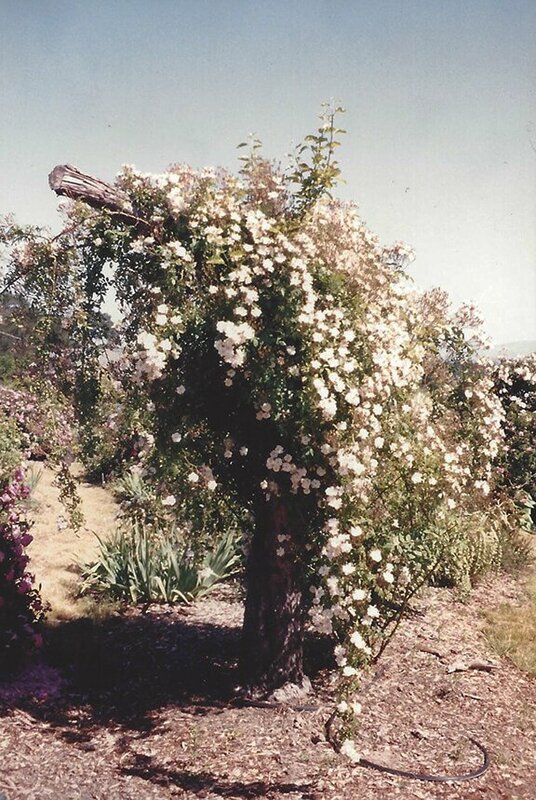 In 1992-3 stage 3 of this garden was developed and planted: 983 Hybrid Teas and Floribundas in an amphitheater, surrounded by 300 Hybrid Perpetuals, Bourbons, Ramblers and species roses. At the top a long arbor with three pergolas and parallel walls of old climbing roses. Friends have been a part of this rose collection from the start. 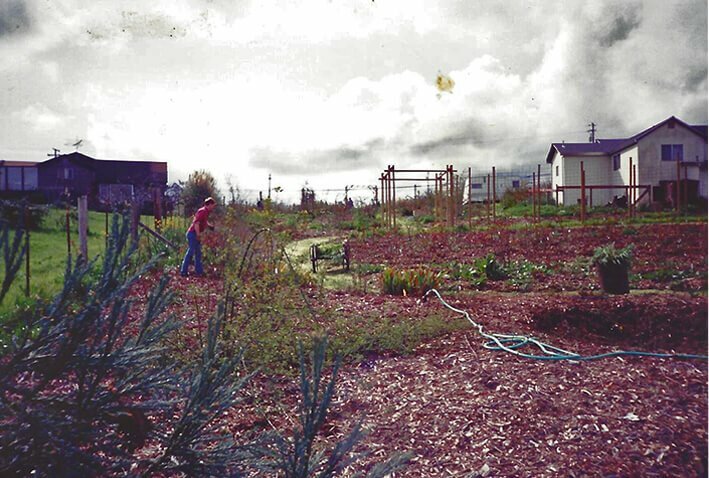 Here in about 1992-3, James Sagmiller helps with the las of the planting of roses. The rose walls in about 1993-4. A great collection of old Tea and Tea-Noisette climbers have stood the test of time, and even held out against gophers! 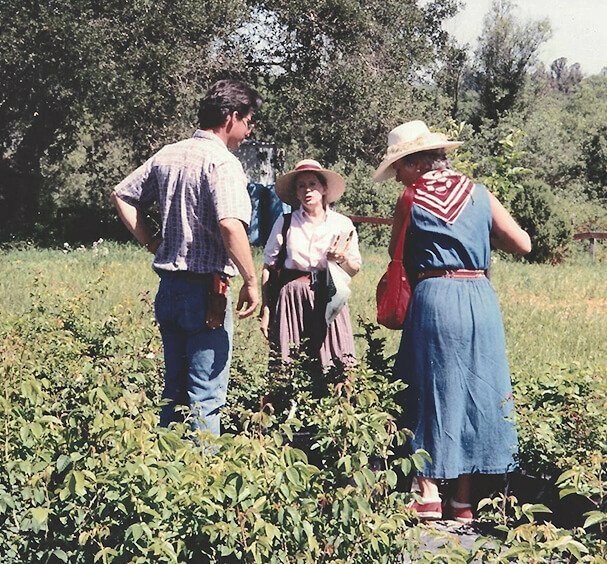 Iris and perennial companions in the early garden, 1993, filled beds of Tea roses. The Damask Perpetual section of Portland roses. Amphitheater beds with their background walls of climbers, mid-1990s. May, 1996. The lovely Joy Wolfe among the Gallicas, before hedges and cypresses had grown up. The old European rose section at the top of the hill. Historic iris, white foxgloves and a mass of old roses. Time stands still and the air is alive with fragrance. The Garland, a rambler favored by Gertrude Jekyll, grown in the faded frame of an old Gravenstein apple tree, inspired by Vita Sackville-West’s Sissinghurst Castle garden. 1996, old roses and a bright horizon. An explosion of roses, 1994. A young nurseryman answers questions. A stream of visitors, with Dr. Gene Peck in the lead—the man who lent a hand to help us grow the collection, 35 years ago. The Celebration of Old Roses in El Cerrito, California brought together a great community of lovers of old roses when it began in the 1980s. That community embraced the Vintage collection of historic roses and supported the building of a garden to display these living treasures. The many friends we made back then have continued to the present to make a difference. 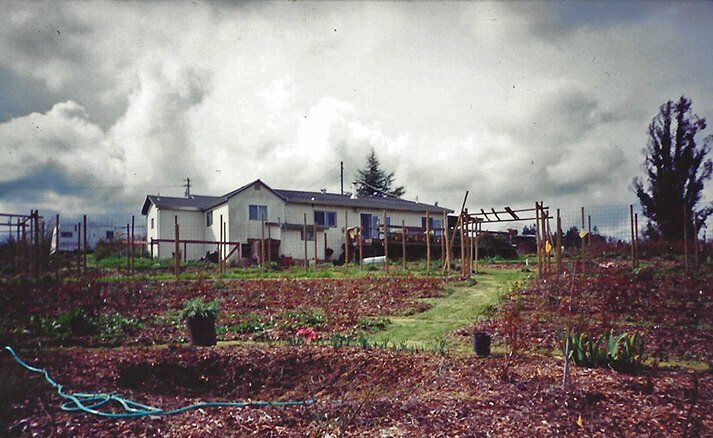 Dr. Gene Peck of Oakland stepped up to make certain we got a start with a site for the roses to live. It is fitting that today this collection belongs to the world, to all of the Gene Pecks in it, the friends of vintage roses. 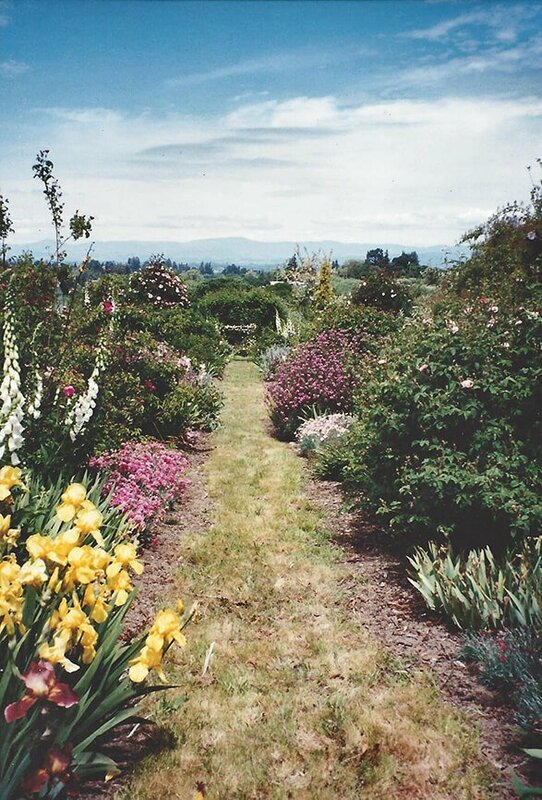 Share with us your memories of the Vintage Roses open garden in Sebastopol. Send us some photos if you have any.